Kevin hart may only come up to Lebron James' knee caps, but he is not about to let the NBA star box him out of also helping black children attend college. I hope this is just the beginning of more black celebrities PUBLICLY stepping up and helping educate our future. George L. Cook III African American Reports. Following on his generous $100,000 scholarship gift made in 2015 through UNCF to four deserving college students, actor and comedian Kevin Hart has joined forces with UNCF and KIPP (Knowledge Is Power Program) to help 18 more KIPP students earn a college degree. 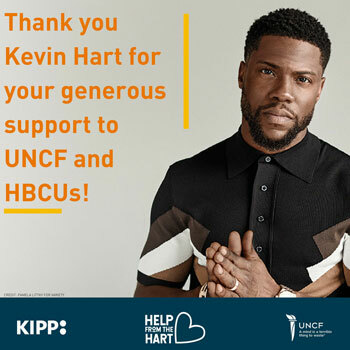 Through a new UNCF scholarship program launched in partnership with Kevin Hart’s Help From The Hart Charity and KIPP Public Schools, the $600,000 scholarship will provide funding to support KIPP students from eight different cities who are attending 11 historically black colleges and universities (HBCUs). UNCF is the largest provider of college scholarships for students of color in the U.S., awarding more than $100 million in college scholarships annually to deserving students. The 18 Help From The Hart Charity Scholarship recipients have been selected based on their academic and personal accomplishments and may receive substantive renewable awards based on need. The 18 students receiving college scholarships are high school graduates who attended KIPP public charter schools in eight different communities: the Arkansas Delta, Atlanta, Baltimore, Chicago, Houston, New Orleans, Philadelphia, and Washington, DC. A recent survey of KIPP alumni across the country showed that the KIPP graduates who attend HBCUs reported a stronger sense of belonging, better mental health, and were more likely to have a mentor than those attending non-HBCUs. Hart’s gift to fund this new scholarship program puts him in line with many other renowned celebrities—like Lou Rawls, Ella Fitzgerald, Clifton Davis, Michael Jackson, Janet Jackson, Anthony Anderson, Beyoncé, Chris Rock, Usher, Pharrell Williams, Ray Charles, John Lennon, Ruby Dee and Ossie Davis who, realizing the value of a quality education, have supported UNCF over the years. “Giving back to build better futures is the name of the game, and we hope that others like Kevin will understand why educational investments are so important, especially now, and step up to help more deserving students,” said Lomax.